First I am against the establishment of an Islamic state, especially one governed by Sharia law in all or part of Palestine. However I am also tired of hearing people talk about the “destruction of Israel”, when they mean the end of Israel as a state with a Jewish majority. Some people see it as being obviously the same, but to me destruction of Israel brings to mind the exact same thing as the destruction of Gaza brings to mind. Massive bombing and artillery raids, raining death and destruction, not a change in the political status quo. To look at it from the other side. 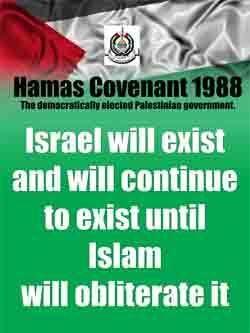 If there was an Islamic state in Gaza (or in the West Bank or both), calling for its end and advocating that it should become part of the Jewish state of Israel would not be calling for the destruction of Gaza or the destruction of Palestine (in my opinion). People advocating the end of apartheid didn’t advocate the destruction of South Africa. Using the term destruction to me is just propaganda. White South Africans probably warned that they would all be killed if apartheid came to an end, and in their case they were about 10% of the population not about 50% as in the case of Israeli Jews. Was there death and destruction of the 10% of whites by the victorious 90% of blacks and non-whites? No. So I don’t believe that death and destruction are a necessary consequence in this case either. To be clear I’m not in favor of a one-state solution. I am only saying that it would not necessarily lead to death and destruction. It might, but it might not. Also to be clear I similarly object to the term genocide being used to refer to what has happened to the Palestinians. To me genocide means the physical destruction of a people. And that hasn’t happened, not yet at least. This is clearly a disgusting religious passage, the sort of thing one may find in many religious books, such as certain genocidal exhortations in the Old Testament. So it is not clear what the real intent is. Is it the former statement of war and killing Jews, or is it this statement of some sort of coexistence under Islamic rule. In any case I am in no way shape or form in favor of an Islamic state, whether based on Sharia law or not. And I think this is a big issue one should have with the charter. Though it is brought up less often than the other two points. To me the term obliterate here does suggest physical destruction. Which doesn’t have the same connotation. I don’t know if this is a deceptive translation or not. Oddly enough the original Arabic version is difficult to find. Which may suggest that the claim that it is a historical relic (below) and not relevant may be true. Most totalitarian movements make it a point to publish their propaganda platform widely. Now having considered this I’ll state that current Hamas leaders have said that if there was a two-state solution along the 1967 borders with the Palestinian capital in East Jerusalem, they would hold a referendum for the Palestinians to decide whether to continue their struggle or not. Update: As a reader has pointed out Hamas dropped the call for the destruction of Israel from their program (this was in their manifesto/platform for the 2006 elections), and now wants a state based on the 1967 borders as given above, but they are still not willing to recognize Israel’s right to exist.